After a year in the making, with an incredible team of volunteers plus support from both Canadian Science Publishing and Genome Alberta, Science Borealis is ready for launch! Friday, 22 November, marks the official launch date of our Canadian science blog aggregator, at the Canadian Science Policy Conference in Toronto. As part of a session on Science Blogging, organized by Lisa Willemse of the Stem Cell Network, we’ll be unveiling the user-ready Science Borealis site and calling for additional blog submissions and more volunteers. 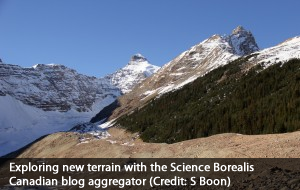 From blogs about Science Communication and Outreach, to others about Transportation Infrastructure, from Environment & Earth Sciences to Health & Medical Science – Science Borealis aggregates a range of blogs in both French and English to satisfy your scientific curiosity. What started as a series of comments about collating Canadian science blogs on Maryse de la Giroday’s 2012 end-of-year blog post, has become a Canada-wide network of scientists, science communicators, science artists, and more – all aiming towards the same goals. To increase the profile and credibility of science blogging in Canada, to strengthen the science communication community, to increase science literacy amongst Canadians and give science a public profile – and also to push for the inclusion of science in evidence-based policy making. These lofty goals are best achieved with your help. Are you a Canadian with a science-related blog – or know someone who has one? Follow our submission process to add your blog to the aggregator and connect with the broader community, while also driving more traffic your way. Always wanted to start a blog, but not sure where to begin? Register with the site to comment on blogs and get involved in the conversation. Check out our Resource Centre and talk to your friends and colleagues – chances are at least one of them is blogging already! Writing a term paper and looking for a uniquely Canadian perspective? Search the blog feed for posts relating to your science topic and use them as a starting point for further research. Just received a policy brief – as a municipal, provincial, or federal politician – and not quite sure what to make of it? Search our blog database to find well-written, clearly-explained science relating to your questions. Can’t find what you’re looking for? Contact us if there are categories you’d like to see added, or existing categories populated with more blogs. Let us know if we’re missing something – or someone. But most of all – SHARE! Share our site and our goals with your friends, colleagues, Twitter lists, and more. Canada has a strong science community – and engaged science communicators to go with it. Help spread the word about Canadian science, science communication, science in public and science for policy making. 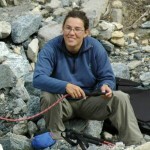 Announcements and Site News aggregator, Canadian science blogging, launch, Sarah Boon, science borealis, welcome. permalink. psst… you really need to add a social media sharing button of some kind… just sayin. Good luck! Great to see this. Thanks Colleen! Will pass on the sharing button idea to the tech team – still ironing out some of the site details! I have been blogging on science related matters for about 5 years (256 blogs so far). My subject is wildlife conservation. >90% of the blogs are about this or about storytelling, as most of my gigs are stories about a wildlife vet in Africa or about moose (from my books, in both cases). For instance today I have been in Hazlet, SK (popn 300) and did stories on Africa to the kids (K-12) in the morning and at the library in the evening. I do hope that you astronomers, physicists, hydrologists and their relatives accept that biological science is still science. My latest blog was about strychnine poisoning of wolves. Thanks for the comment Jerry – you’ll notice we have a section for Veterinary Science, where your blog might fit quite well. Looking forward to getting your blog submission form! Ps – I am a Banff Sci Comm alumnus and Jay Ingram wrote a nice blurb for my book “Of Moose and Men: A Wildilfe Vet’s Pursuit of the World’s Largest Deer.